A game's audio can have a huge impact on the overall experience. 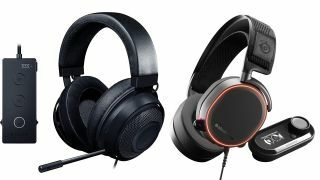 We've selected the best PC headsets for gaming to help you capture these sounds, and we've found the cheapest price for each one. Good audio doesn't have to cost the earth, and some PC headsets perform way better than their relatively low costs suggest. We know because we test all our headsets before adding them to this guide, and we're always aware of what each one costs. What's more, some of the best headsets can be used for other media, like movies, TV and music, so they're a great investment. Our top-rated PC headset is currently $15 off at Walmart. At $75, this is a great price, so you should snap it up. What makes for the best PC headset for gaming? It's a mixture of things, but sound quality, comfort, and having a decent mic are top of the list. When you're looking at sound quality, it isn't necessarily about how loud the headset is, but the range of audio (frequency response) that counts. Sure, you can get away with cheaper headphones if you just want louder bangs in shooters, but for more detailed and rich audio, you need something with a good range. Comfort is a big one too. You're wearing a gaming headset for hours at a time, so how do the ear cushions feel? Is the headband comfy? How tight does it grip your head, and is it adjustable? Finally, the quality of the mic is essential for online games, where communication is key. Not only that, but can the mic be detached or retracted for when you're not playing with others? It's all stuff to consider. Here are our picks for the best PC headsets for gaming. If you're looking for a mix of quality and great value, the Razer Kraken Tournament Edition is the best PC headset for gaming right now. You can pick it up for less than $100 / £90 at the moment, and that's a hell of a lot of headset for your money. Essentially, this is a PC-optimized version of the Razer Kraken Pro V2, which is our top pick in both our best PS4 headset and best Xbox One headset guides. You actually get enhanced audio with the Tournament, which offers THX Spacial sound instead of the Kraken Pro V2's regular stereo audio. The result is that the surround sound, and your placement within the gaming world is better here. This headset comes with a USB connection too, which is handy for PC play. What sets the Krakens apart is their comfort and value. You can wear this headset for hours and it feels better than most other gaming headsets you can buy, even the vastly more expensive high-end models. And the sound the Kraken TE delivers punches well above its weight when you consider how cheap (relatively) this is. There's even a volume control box that you can stick to your PC desk, to stop it shifting around if you move your head. There are downsides - the mic isn't the highest quality (a problem with all modern Razer headsets), and the volume control button is the least well-designed aspect of the whole headset. But if you're looking for something top value and high quality for your PC set-up, this is tough to top unless you start spending way more money. If you're looking for a higher budget headset, designed with PC in mind, the Steelseries Arctis Pro with GameDAC is the one to buy. While the drivers are smaller, they deliver an excellent frequency response range (10-40,000Hz), which is actually more than the human ear can perceive. The result is audio far richer than most other gaming headsets, which makes the Arctis Pro a great all-rounder, ideal for anyone who switches between gaming and other PC usage. Which we all do, right? The design of the Arctis Pro is unusual too, offering more of a headband style than other headsets, which makes it comfortable in a different way. It's still very wearable after hours of play, although becomes a little looser after months of use (the headband can be replaced cheaply and easily, however). What makes this model stand-out, however, is the GameDAC, which fulfils a number of roles. It not only lets you change volume and audio settings, but it also takes the processing of the headset away from your PC's hardware, so you don't have to take any knocks in performance while you use it. The mic is great too - better than the Razer headsets - so if you're doing a lot of talking in team-based games, or you want better personal audio for streaming, the Arctis Pro performs better than the competition. A great PC headset, then, but one that comes at a serious price. The Razer Nari Ultimate is a wonderful, feature-packed wireless headset that - unlike many other PC headsets - actually justifies the asking price. And that's saying something, because this is an expensive piece of kit. Let's start with the sound. It's not just loud, but crisp, and there is virtually zero artefacting (little incidental noises or sound cut-outs) from the wireless connection, thanks to an impressive 2.4GHz connection. The THX spacial means that the sensation of being inside the gaming world you're playing is near unparalleled, and you can pinpoint where each sound is coming from in your game - whether they be incidental noises, or approaching enemies hoping to shotgun you in the back. What sets the headset apart is the haptic feedback, which means the ear-cups actually vibrate as you play. It's not the most essential feature, but it's a cool extra that does slightly enhance the way you listen. While you undoubtedly pay a little extra over the regular Razer Nari for the Hypersense tech, there are enough boosts over the vanilla model to justify the Ultimate's 25% higher price. The drivers are bigger, and frequency response range better, and the Ultimate's mic is retractable, so you can remove it completely from view if you're not using it. We're not keen on the mic, and did have a couple of issues with our voice cutting out, but it's not a huge issue. The charging time of the headset's battery has been decreased too, and now takes about 4 hours from zero to full. It's an exceptional headset that only loses out to the Razer Kraken Tournament on account of its higher price making it a more 'luxury' purchase. If you can afford a great, high-end wireless headset, this is the one to get. The Turtle Beach Elite Atlas is a headset aimed squarely at PC players, but at a reasonable price. It's a little cheaper than the Elite Pro and Pro 2, but very much cuts down on the frills to deliver in areas that truly matter. It's a super comfortable PC headset, especially if you wear glasses (thanks to the actually good Glasses-relief system), and the sound quality is high thanks to some quality 50mm drivers. No, it doesn't quite match the Razer Kraken in this department, or the Steelseries Arctis Pro, but the audio is still above average for a mid-priced pair of gaming cans. As ever, the mic is good quality - something Turtle Beach does well - so this headset is perfect for team-based online play. Combined with the Windows Sonic sound, which gives excellent directional audio, this makes for a great eSports and competitive gaming choice. Although, to be honest, we'd recommend it for everyday players too. The only real drawback is that the sound range can't match better 'mixed use' headsets, so this isn't as great for video and music audio. As a pure gaming headset, at a competitive price, it's a winner. The HyperX Cloud Alpha is an archetypal gaming headset. While it isn't pretty, or filled with fancy features, what it does is deliver superior sound and comfort at a reasonable price. You could just as easily pick up the HyperX Cloud 2 and get a similar experience, but we recommend the Alpha for a couple of key reasons. The biggest one is that the frequency response range is slightly better in the Alpha, so it offers a slightly richer sound for all different uses. While it doesn't have the 7.1 audio of the Cloud 2, its stereo sound is pretty much as good, so there's no issue with working out where sounds come from in the gaming environment. The audio is further enhanced here by the dual-chamber drivers, which essentially separate the bass from the other sound types, allowing for a slightly richer audio. It's a comfy headset too, and feels nice and chunky, so you're unlikely to break it. There's an in-line control, instead of a separate box, and it's fully adjustable for all head-sizes and shapes. The mic, which performs well, can be detached too if you're playing offline. This is a good mid-range pick, with audio and durability at the heart of the design, making it perfect for everyday PC play. There's a lot to love about this mid-range wireless gaming headset. The Steelseries Arctis 7 is an elegantly designed wireless PC gaming headset, but one that has enough versatility to be used with any of the wireless (or wired) audio devices in your home. While it isn't the very best gaming headset on this list, it's one that can be taken outside the PC and into the wider world. Or at least used with your game consoles... So what's the deal with it? As with most Steelseries drivers, the 40mm ones in this gaming headset perform extremely well, although this doesn't have the frequency response range of the Arctis Pro, so the audio isn't quite as rich. What does seriously impress is the battery life, which offers nearly 20 hours of use before you need to charge it again. Combined with the decent wireless connection - where the audio isn't quite as pure as the Pro, but is still excellent - this is a great wire-free option for busier PC set-ups. The headband design is comfy, the price is great for what you actually get, and the design of this headset is so lovely you could wear it out and about. It's a great wireless option. If money is tighter, but you still want a great PC headset, you should look to grab the Logitech G Pro gaming headset, especially if you can find it at a reduced price. While it lacks the bells and whistles of the high-end headsets, this one is light (it actually weighs in at 259 grams) durable, and well designed for lengthy gaming sessions with your PC. There's no extra control box or fancy features, but the G Pro does the basics very well. Sound quality is good, without being stunning, but you still hear an incredible amount, especially online. This headset is endorsed by several competitive CS:GO players, and it's easy to see why; the fidelity of the sound combined with the light weight makes it ideal for long, stressful online games rather than rich, immersive single player adventures. The microphone is generally very good, and we had no problems while testing it, but there have been complaints online about it being inconsistent. So make of that what you will. If you find this headset for $60 / £55, we recommend snapping it up, because that's the sweet spot for price. And if you do, it's a genuine hardware bargain. If you're going seriously budget, get the Corsair HS50. Other headsets in this price range - with the exception of the Turtle Beach Recon series - are often cheap, uncomfortable, and offer sub-par sound. Not so with the HS50, which manages to deliver comfort and decent sound for a price that hovers around $50 / £45. The 50mm drivers don't offer the biggest frequency response (although they are rather good), but they're nice and loud, delivering booming bass and swelling scores in most games. The audio only really suffers in sound-rich environments and with dialogue. It's very comfy too, and chunky enough that you don't worry about breaking them if you put them down on your desk too hard. While there aren't many features, you do get on-ear controls, and the built-in mic is reliable enough to see most people through an online session or two of Destiny 2. Overall, this isn't the most accomplished, exciting PC headset you'll find... but it's cheap and does a great job with the stuff that actually matters.